In honor of World Penguin Day I have this penguin themed lunch. I used the cookie cutter holding food technique that I first found in the book Happy Bento! : Lunches on the Go. Check out the author’s blog at Becoming a Bentoholic. This metal penguin cookie cutter had a handle but my husband cut if off using a dremel tool. Note: Because of the metal cookie cutter do not heat this meal in the microwave. I enjoy this orzo pasta cold. 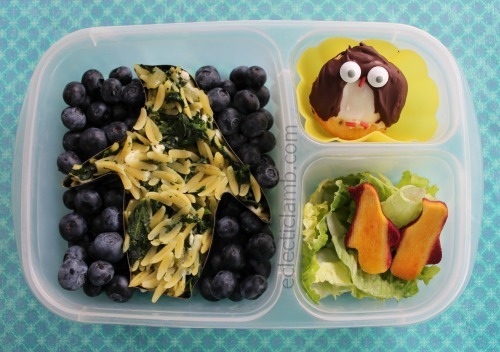 This entry was posted in Bento / Cute Food and tagged animal, Cookie Cutter, EasyLunchboxes, pasta, penguin. Bookmark the permalink.